An effective method for accessing novel substituted thieno[2,3-d]pyrimidine-4-carboxylic acids in 63–71% yields based on Pd(dppf)Cl2-catalyzed carbonylation of substituted 4-chlorothieno[2,3-d]pyrimidines has been proposed; a procedure has been developed for obtaining the amides of these acids, suitable for liquid-phase combinatorial synthesis, in 53–77% yields. Compounds with antimicrobial activity against Pseudomonas aeruginosa similar to the reference drug streptomycin were found among the synthesized amides. The online version of this article ( https://doi.org/10.1007/s10593-019-02437-1) contains supplementary material, which is available to authorized users. The authors are grateful to Enamine Ltd. for providing the equipment for carrying out reactions in autoclaves and registration of 1H, 13C NMR and LC-MS spectra of the synthesized compounds. 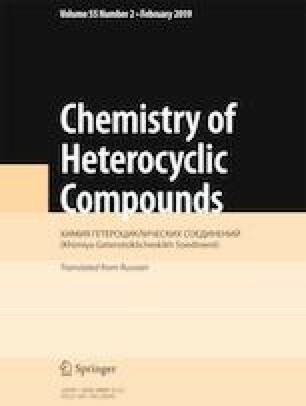 The authors also thank the head of the laboratory of biochemistry and biotechnology of Mechnikov Institute of Microbiology and Immunology of the National Academy of Medical Sciences of Ukraine (Kharkiv) Candidate of Biological Sciences Senior Researcher T. P. Osolodchenko for conducting the antimicrobial activity test of the synthesized compounds.